As we all know that cloud computing is one of the trending technology for data storage and sharing. Although its beneficial, it has to evolve more to be efficient in various models. One of the article submitted to IJSRD journal by Vishakha Om.Gupta and Prof. Yogesh Rai from Shree Institute of Science & Technology, RGPV University, Bhopal is focusing on Achieving CPEL Criterion in Cloud with High Bandwidth and Cost Reduction. Cloud computing implementation is fast and simple with benefits like, Cost reduction by gaining a worldclass IT infrastructure without the hardware, secure access to critical information 24/7 using only a Web browser, ability to stay mobile and many more. According to the survey 85 per cent of public sector organizations are using public cloud services, while on the other side data owner having concern about data confidentiality and query privacy due to the lost control of the infrastructure. To address these issues a criterion called CPEL is constructed; Data confidentiality, query privacy, efficient query processing, and low in-house processing cost. Satisfying these requirements will dramatically increase the complexity of constructing query services in the Cloud. Some related approaches have been developed to address some aspects of the problem. However, they do not satisfactorily address all of these aspects. We proposed the random space perturbation (RASP) approach with traffic redundancy elimination techniques, in which practical range query is constructed by using k-nearest neighbor (kNN) and range query algorithm, and to reduce redundancy in process predictive acknowledgement algorithm and redundancy aware routing algorithm is used by this way we can achieve CPEL criterion with high bandwidth of data processing with reduced cost. RASP is combination order preserving encryption, dimensionality expansion, random noise injection, and random project because of order preserving encryption confidentiality and indexing preserved by dimensionality expansion range query processing can be achieve , Random projection is mainly used to process the high dimensional data into low dimensional data representations which provides good scaling potential and performance , random noise injection used for adding noise which in result gives proper output . In random space perturbation, the word perturbation is used to do collapsing this process will happen according to the key value that is given by the owner. In this module the data owner have to register as owner and have to give owner name and key value. 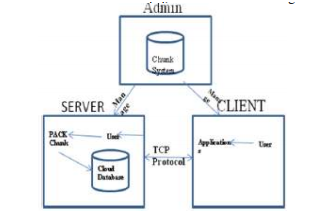 And then the user have register and get the key value and data owner name from the owner to do access in the cloud. Here user can submit their query as range query or kNN query and get their answer. We analyze and show the result with encrypted and also in decrypted format of the data for the query construct by the user. kNN query cannot be directly impose on RASP perturbated data, so we have designed a kNN query processing algorithm based on range queries .We use square ranges, instead of spherical ranges, to find the approximate kNN results, so that the RASP range query service can be used. 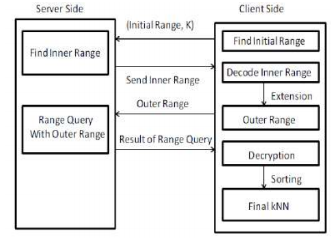 As shown in below fig.1, working of RASP with kNN and Range query service, but here authorized user can upload, download, updates the similar data which increases data processing cost, to address this problem we are using predictive acknowledgement approach which is based on byte stream processing, Byte stream means it store the file as 1 byte that is 8 bit as a sequence of file, because of these increases the file download speed while transaction between the cloud and its end user’s. As shown in below fig. 2. To know more about such articles with innovative ideas please visit ijsrdscholarticles website.